Get a jump on the Holiday Season and create this exciting Sarah Vedeler Design using your Embroidery Module. 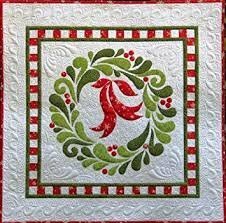 You can cut the appliques with a rotary cutter or use your AccuQuilt Go Cutter to save time and energy. You will also learn methods that will aid you in hoop placement for other projects. Join us for a fun day of sewing comradery and creativity. Hi, I’m Carol Gries and I am so pleased that we will be working together on Feather Fancy. In addition to creating a beautiful wall hanging, you will learn many new skills that you can apply to future projects. Here is a list of the materials you will need. Embroidery Machine and bring all your hoops. Fabric (Gail has kits if you wish) Otherwise see CD “to make the Quilt top” for amounts. Please prepare your appliqued pieces at home. This will save substantial time in class. If you are using Accuquilt, follow the instructions on the CD under “Instructions” and then “to make the Quilt top”. If you are using a rotary cutter, you will find the templates on the CD under “cutting” and then “Fancy Feather Templates”. Then follow the directions under “Instructions” and then “to make the Quilt top”. Either method you use, bring your extra pre-backed fabric to class. If you have any questions, please contact me at 617-493-0008 or drgries@ptd.net. I look forward to meeting you or seeing you again.